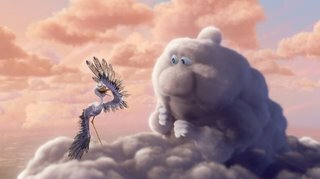 If you've seen UP, then you've (hopefully) also seen the charming short film that precedes it, Partly Cloudy. Of course it looks best on the big screen - and it's pretty neat in 3D, too - but you can purchase and download it from the iTunes store right now! I am so going tomorrow to the 3D IMAX! So it was you the guy who made that funny alien video?! Beautiful blog, I love it! Fantastic work. That is the newest twist on the old stork theme. I laughed hard. Awesome work. Great work by pixar. I loved the story, It was very captivating, alot of emotion. It reminded me of the same feeling you have about christmas when your a child. Hows the hair growning going?